Labour leader Jeremy Corbyn, meanwhile, was criticised over his “letter to Santa Claus” – also known as his party’s spending manifesto. ANGRY VOTERS ROUNDED on British Prime Minister Theresa May in a live television grilling yesterday, just six days before the general election and at the end of a tough week for her campaign. 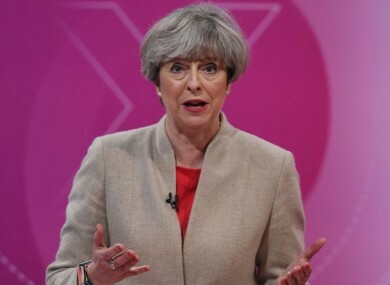 The Conservative leader was accused of “broken promises” for calling an early election for 8 June after she had repeatedly said she would not, and for a U-turn on a key manifesto pledge on elderly social care. “I could have stayed on doing that job for another couple of years and not called an election. I had the balls to call an election,” May told the BBC audience in York, northern England. The prime minister called the election three years early, warning that opposition parties threatened to derail her plans to take Britain out of the European Union following last year’s referendum vote. She has been accused of seeking to take advantage of her party’s 20-point poll lead over the opposition Labour party — which has now dwindled to the low single figures. May repeated her mantra that “the only poll that matters is the one that takes place on polling day”. In another difficult moment, she was challenged by a woman who struggled to hold back tears as she described waiting for more than a year for counselling on the state-run National Health Service (NHS). “I’m not going to make any excuses for the experience you had,” May said. Afterwards, Labour leader Jeremy Corbyn faced the same audience and his own tough questions over his party’s manifesto of spending promises — which one audience member called a “letter to Santa Claus” — and his record on defence. The leftwinger’s lifelong opposition to nuclear weapons has drawn severe criticism from within his own party, and he was heckled yesterday for refusing to say whether he would launch a retaliatory strike if Britain was attacked. “If we did use it, millions are going to die. You have to think these things through. I will decide on the circumstances at the time,” Corbyn said. He said it was a “shame” that May refused to debate head-to-head with him before the election. On Wednesday she sent Amber Rudd, the Conservative Home Secretary, to a TV discussion with six other party leaders. Email “May accused of 'broken promises', but defends 'having the balls to call election'”. Feedback on “May accused of 'broken promises', but defends 'having the balls to call election'”.